In this chapter, the concepts of integrated pest management (IPM) and integrated production (IP) are explained, and the most important definitions are given. The legal framework for regulation of IPM in the European Union is specified, and the general principles are explained. The EU Framework Directive requires that all EU member states develop a national action plan (NAP), which ensures that a set of eight general principles of IPM are implemented by all professional pesticide users. Along these principles, the authors present an overview on important examples for new and innovative developments and attempts in plant protection to enhance sustainable agriculture. 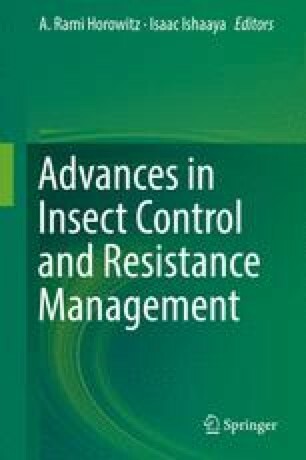 They give short introductions in selective and biorational pesticides, anti-resistance strategies, and new methods for monitoring pest insects by semiochemicals. Furthermore, they give an overview on the diversity of nonchemical methods in pest control. These methods include mating disruption techniques mediated by semiochemicals and substrate vibrations, mass trapping, attract-and-kill techniques, the use of repellents, antifeedants and deterrents, as well as more complex push-and-pull strategies. The authors thank the editors A. Rami Horowitz and Isaac Ishaaya for the invitation to write this chapter and the anonymous reviewers for their constructive comments, which helped us to improve the manuscript. We thank Annett Gummert and Silke Dachbrodt-Saaydeh (Julius Kühn-Institut, Germany) for providing literature. We are grateful to Eva M. Gross (Schriesheim, Germany) for linguistic corrections of the manuscript.